Embroidery is a general term used to describe the art of decorating fabric with thread or yarn, using a needle and basic stitches. Most of us are familiar with specific embroidery techniques such as counted cross-stitch, quilting, crewel and smocking. The history of embroidery spans centuries and continents; the earliest “needle decorations” can be traced to 3000 B.C. in Egypt. Since then, each culture has contributed its unique combination of fiber, fabrics and design, creating the myriad of embroidery techniques we know today. The Chinese, for example, perfected beautifully detailed silk-thread embroidery. Scandinavians mastered even-weave fabrics and such counted techniques as Hardanger. In India, people worked with elaborate gold and metal embroideries. Italians crafted delicate laces and cut-work. Northern tribesmen of Africa embroidered braid and metal threads; western tribes appliqued. Central and South Americans stitched brightly colored florals and designs in reverse applique. The Russian and Slavic peoples produced bold, primary-colored cross-stitch motifs. Native Americans executed intricate bead work, and American pioneers, from necessity, created their unique application of quilting, which became known as patchwork. The variety and depth of embroidery supplies on the American market today is unparalleled. You can create your own design, selecting the fabric and threads from open stock, and coordinating stitches, or you can purchase a kit. A kit usually includes all the necessary fabric, threads, design and stitch information for completing one specific project. Embroidery applications are equally varied, from traditional bell-pulls and pillows to contemporary wearable art, to Christmas tree decorations and canning jar covers. It’s a creative, relaxing and fun pastime, and no matter what your taste, there is a form of embroidery you’ll enjoy. The “How To” series of easy-to-read and use needlework instruction booklets is designed with you in mind. 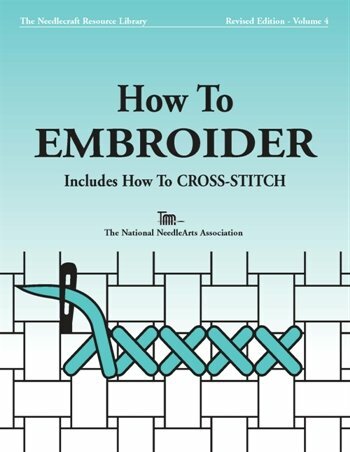 Whether you are a beginner looking for basic instruction that will get you stitching quickly with correct techniques, or an experienced needleworker looking for a handy reference guide, you’ll want to keep the “How To” series close at hand. Each volume in the series explores a different type of needlework: needlepoint, embroidery and cross-stitch, knitting, crochet, and much more. You’ll find lots of helpful hints to build your confidence, make your learning experience relaxing and fun, and most important, make your finished project something you’ll be proud of for years to come.